Looking for a new hobby? Get into wood carving and whittling with this introductory kit from Morakniv! It comes with everything you need to get started: a Morakniv 120 Carving Knife, a belt sheath, and a rough cut Dala horse sculpture. 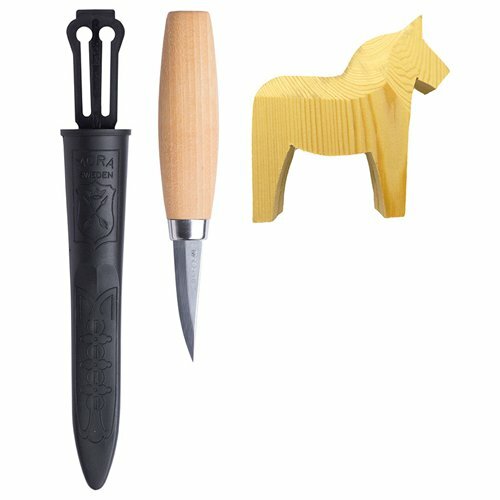 The Dala is a traditional Swedish wooden horse figurine that woodworkers have been carving and painting since the 17th century. Why choose this carving knife kit? A flat ground blade tapers all the way from the spine to the edge from both sides into a distinctive “V” shape. This style of knife sacrifices edge durability for extreme sharpness.